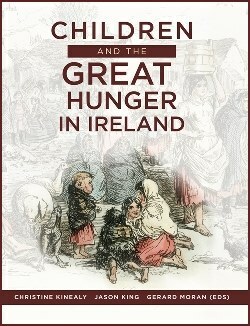 New from Cork University Press is Children and the Great Hunger in Ireland, which explores the impact of The Famine on children and young adults, one of the most vulnerable groups in terms of disease and mortality in any sustained period of food hunger. The 328-page paperback is edited by Christine Kinealy, Jason King and Gerard Moran. It takes a multi-disciplinary approach to the subject and includes research contributions from leading scholars on both sides of the Atlantic. The early chapters demonstrate how government relief, most notably the Poor Law, failed to make special provision or protection for children, treating them as being just as ‘undeserving’ of assistance as adults. A consequence of this approach was exceptionally high child mortality, as the chapter, based on a study of the skeletons in the Kilkenny workhouse grave, shows. Other chapters focus on emigration, the loss of language, the maintaining of an Irish (Catholic) identity, folk memories, children’s literature, and writing a Famine curriculum. In keeping with its multi-disciplinary approach, Children and the Great Hunger opens and concludes with reflections by award-winning Irish authors, Marita Conlon-McKenna and Michael Collins. ISBN 9780990468691. Price €25.00 / £21.95.